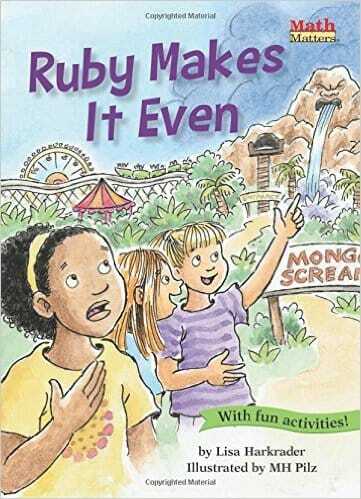 Ruby and her two best friends are excited about going to the amusement park. That is, until they discover that the rides they want to go on have seats for two, not three. Someone will have to ride alone?or will they? Lisa Harkrader’s ‘Ruby Makes It Even’ (2015), a recent title in Kane Press’s Math Matters series, is a perfect mathematical story to introduce young children to the concept of odd and even numbers. Set in a theme park, the protagonist, Ruby, and her friends went on an emotional roller coaster (pun intended) when they realised that for some rides, they would be sitting on their own, while for others, they would get to sit with their friends. Connecting mathematical concepts with emotions is quite effective here. Illustrations by MH Pilz are helpful in illustrating odd and even numbers very clearly. Diversity of characters in the story is abundant. Particularly, we are pleased to see a female ethnic leading character. As with other titles in the Math Matters series, useful teaching activity ideas are offered at the back. All in all, an engaging mathematical story with a storyline that children can easily relate to. Well done, Team Kane Press! Recommended for children aged 5+ years old.